I've passed on your debate with Selena to several others, all find it fascinating. 'Twas ever thus surely! And your Twilight foray shows that nothing much changes. Re Horace, there's a parody of Huxley by Cyril Connolly in which a guest at a Huxleyite residence finds a copy of the odes by his bed, 'apparently a first edition'. Wonderful. Reassuring words there Edwin. Must look out for Cyril 'Smarty Boots' Huxley parody. I like his Brian Howard spoof "Where Engels Fears to Tread" and his book collector maniac Edax. Talking of Horace we had a van driver the immortal Bill Selwyn who used to read Horace sitting in the van while we were out buying --got a feeling it was in Latin too. He also used to read Orison Swett Marden - why I am not sure. I just finished MELMOTH THE WANDERER on a PDA. Pain to read, but it was a lot easier than lugging around a 600 page book. I agree, the small display made Maturin's terse verbiage worse. On a brighter note, Sony is pushing both their 300 and 600 series Reader to compete with the Kindle. 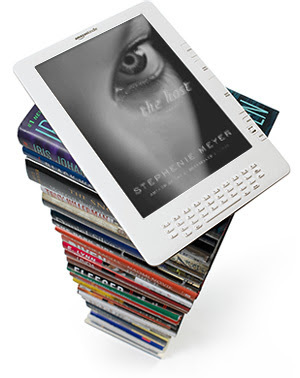 The 900 series Daily Reader with a 7" screen and Wifi ability will be out in January. I'm reading War & Peace on my iPod. The words are the same on screen as on paper. The fact that there are boring passages doesn't change. And with the iPod I can crank up some heavy techno music to ease the pain. I still read a 'proper' book in bed though. My iPod is only for journeys or when I'm out and about and made to wait.